I love pilates for so many different reasons. Initially, I was drawn in by the sheer physicality of doing pilates movements. I don’t mean that that it was physically very challenging or very hard (… pilates has a reputation for being ‘hard’ but it need not be when done safely and with awareness of the guiding principles… ), no, what drew in me was that I found the classic mat pilates repetoire made me intensely aware of my muscles and bones as no other movement discipline had before. It was very physical for me. It’s a given that if you do pilates regularly and as suits your body, you will become stronger, increase your flexibility and improve your posture. Many of my regular clients attest to these benefits. These are the physical benefits. But the more I engaged with the physicality of pilates, the more I have also tuned into the mindfulness of it. I know ‘mindfulness’ is a buzzword these days, but this is so for good reason. Mindfulness is simply a great tool for dealing with the stressful things that inevitably happen and thus it’s a great tool for improving the quality of one’s life. Mindfulness is stopping and noticing this exact moment in time, right now in your body, noticing your breath, accepting what is. You don’t have to empty your mind of thoughts to be mindful. You notice your thoughts pass by, but you don’t have to follow them. You can choose to redirect your attention to the here and now, the present moment – to your breath, your feet, maybe to the sounds around you or to your posture for instance. You can train yourself to become mindful and thus empower yourself to be master of your thoughts. It’s a great liberation to be in charge of your thoughts! As a result of my own journey, my pilates classes are naturally evolving from not just teaching clients how to apply the five physical principles of Joseph Pilates so that they move their bodies with integrity, but also to sharing ways of being mindful and finding quietness in the present moment. Mindfulness means things like not waiting for life to be perfect – your life is happening right now. It means doing your best in every moment – your best is good enough. It means appreciating what you have and doing what makes your heart sing; life is too short to worry about what others do or think of you! New term of mindful movement through pilates starts next week. I’m looking forward to it! Some spaces still in some classes – so please get in touch ASAP to book! 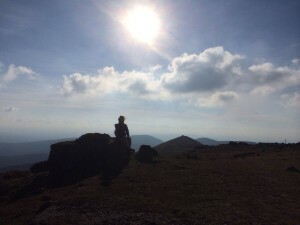 This entry was posted in Blog and tagged breath, breathe, flexibility, mindfulness, movement, now, physicality, Pilates, Posture, present on 4 January, 2016 by Eimear. 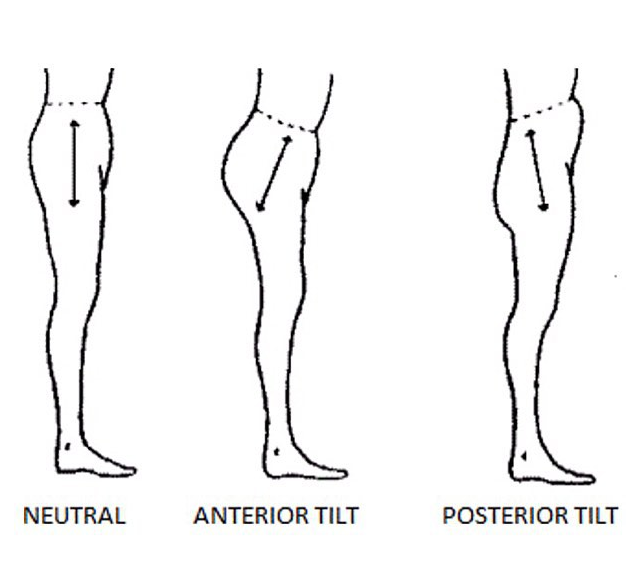 One means of finding neutral is to tip your pelvis forward as far as is comfortable, then tip it backward as far as is comfortable. Neutral is roughly in the middle. If you’re not used to standing or sitting up straight, it may take a while for this to feel natural. Note: if you have an exaggerated lumbar curve (anterior pelvic tilt or ‘lumbar lordosis’), you should strive to go beyond neutral and tilt towards a posterior pelvic tilt to stretch and decompress the lower back. Also, if weak the abdominals, it helps to tilt the pelvis to achieve stability when legs are raised from the lying-on-your-back postion. Think back to set squares in school. Visualise a 90-degree angle as the letter ‘L’. I often refer to a 90-degee or 45-degree angle for where your legs may be in relation to your torso. Mentally slice the 90-degree angle in half for 45 degrees. It all takes time and practice. Take a few moments each day to practice better posture – even weight on both feet; roll shoulders up, back and down; lift through crown of head; abs gently contracted, sensing your centre as you quieten yourself through your breath. 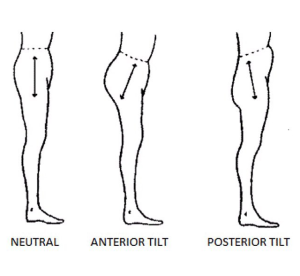 This entry was posted in Blog and tagged alignment, lordosis, lowback, lowback pain, pelvis, Pilates, Posture on 3 September, 2015 by Eimear. Protect your back when gardening! This is the time of year when gardens promise both home-grown food and fantastic floral displays. It’s easy to get over-enthusiastic and overdo it. Today I dug up many giant daisies, montbretia and other perennials that I had planted a few years ago in this prime spot in the garden near the house. 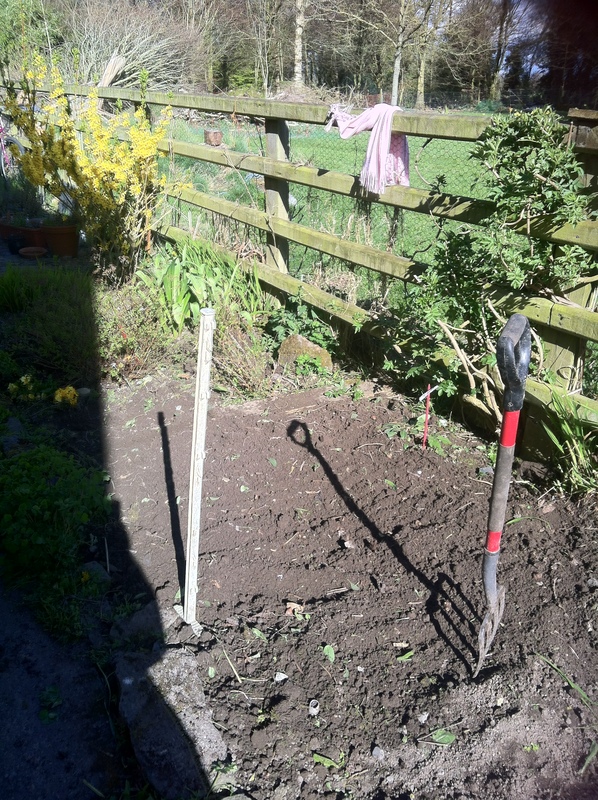 I am reclaiming this sunny bed for green veggies! * Make sure you are comfortable in your body and relaxed before you even begin. I highly recommend pilates roll-down to tune in to your spine before you head out! * Take a good long drink of water. Remember, we all thrive on more hydration than is habitual to take. * Be sure you are wearing shoes with good support, so you can feel grounded through both feet. Digging, planting, weeding tend to be asymmetrical movements that favour one limb or side. So, return frequently to stand upright on both feet and sense where your head and shoulders are. * A gardener’s body weight is often bent over at the hips, putting a great deal of strain on back muscles. It’s better to squat than to bend the back. Focus on maintaining a neutral spine by squatting down to ground level, rather than rounding the spine. * Lift the right way. 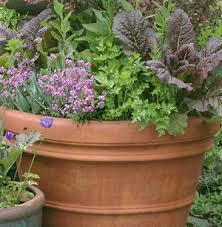 Between lifting bags of potting compost or transporting newly-potted planters, there is a lot of lifting in gardening. Remember – do not lift with your back; engage your abs and let your legs do the work! * Mix it up. If you find yourself in the same position for too long, switch activities for a while and come back to it. * Set a stretch reminder In the garden, it’s easy to get so involved with what you are doing that you forget to use your full body. Take breaks during your work to stretch and move around. * If any low back pain persists after gardening (or any time), the best thing is to lie down on a mat on your back with your knees bent and your two feet flat on the mat. Get your neck and shoulders relaxed and spend about 20 minutes in this pilates rest position. Hope to share pics of my own greens later on! Happy gardening folks! One of areas of difficulty I regularly observe in my clients is in the shoulders and neck. Many people are habitually tense in the shoulders. The head is often held forward, out of alignment with the cervical spine. All those hours staring at a smartphone, doing computer work – or slouching starting with the lumbar spine – take their toll. Muscles at the back of the neck and shoulders tend to become elongated while others at the front get tighter and shortened. It takes good focus and practice to release and drop the shoulders into a good place, while releasing upwards through the very top of your skull. 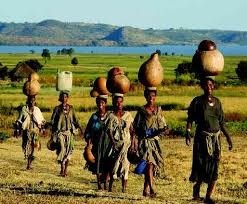 Carrying a weight on the crown of the head as many African women do out of necessity for essentials such as water is luckily not asked of us in our privileged lives. But we can learn from how these women move. Imagine you are carrying a basket of roses. The disciplined shoulder and neck movements of pilates really help to rebalance our elongated and shortened neck muscles. Over time, pilates restores equilibrium. Where pilates really helps is with getting an ongoing sense of your posture. It is not a quick fix but something that grows and becomes part of your everyday being. This entry was posted in Blog and tagged crown, Pilates, Posture, relaxation, shoulders, upper body on 16 February, 2014 by Eimear. Last time I wrote about becoming aware of where your head is in relation to the top of your spine. This post is about your feet — your incredibly important connection to mother earth. The deeper my knowledge of pilates, the more I understand that the feet are the body’s foundation – the tools of balance, mobility, and posture. I always include footwork and foot awareness moves in my pilates classes. Feet are biomechanical marvels. Each foot has 26 bones, 31 to 33 joints, 19 to 20 muscles (it varies according to how they’re counted), along with thousands of nerves (explaining why feet can be so sensitive to touch!). Children are mostly lucky to run around freely on healthy, blemish-free feet. As we get older, our feet often bear the toll of ill-fitting or bad shoes: fallen arches, bunions, hammer toes or plantar fasciitis. Freedom of movement at the joints where the toes meet the feet (the metatarsal-phalangeal joints) is essential for freedom of movement higher up in the body – your knees, hips, pelvis. If you wear routinely wear high heels, you are storing up back and foot problems. You are forced to walk with your pelvis tilted forward, causing unnatural curvature of the spine and placing excessive stress and strain on the low back. Also, your calf muscles and Achilles tendon will be shortenened. Not to mention problems in the feet themselves from squashed toes (see list in previous paragraph). As our feet are mostly tucked away in shoes, it’s very easy to overlook your feet and toes, and forget how much they do to carry and support you. When the weather gets warmer, feet start to be revealed and you are forced to check in with them. But ideally we should be checking in with our feet all year around. Lately, I have been encouraging my pilates clients to work in bare feet as a regular way of checking-in with their feet. –	1) Spread your toes wide, then lift all toes off the floor while leaving the ball of the foot down; progress to lifting just the big toe off while leaving the other toes down, and vice verse. –	2) Stand on the edge of a step with your shoes off. With your weight on the balls of your feet and your heels extending off the edge, drop your heels down to stretch Achilles tendon and calf muscles. –	3) Try picking up a pencil with your toes. Massage your feet frequently – either using your knuckles or pressing down and rolling out on a small ball. Mosturise and care for your feel (before bed is a good time!). Visit a chiropodist or get a pedicure. For a really relaxing treat, go for reflexology. Finally just make your entrance in your high heels! Then switch to lower heeled shoes that won’t cause you long-term damage. This entry was posted in Blog and tagged Feet, hips, holistic, mobility, one body, Posture on 28 May, 2013 by Eimear. One of the best things about doing pilates regularly is that you develop awareness of your posture – and you improve it steadily and surely. As a pilates teacher, I am always proud when I see my clients stand tall and connected with their bodies. Poor posture makes your back vulnerable to fatigue, strain, and injuries. Good posture makes you stronger, less prone to back ache; good posture also makes you look taller! Changing your postural habits is a decision; you need to retrain your muscles, you need to tune in. The first step is to become aware of the position of your body. Start to notice the position of your head. The head should sit over the torso, not in front it. The chin should be parallel with the floor. The chest should be lifted slightly but not jutting forward, the shoulders should be down and back but soft and relaxed. The ears, shoulders and pelvis should line up (when viewed from the side). Keep the shoulder blades back and down but don’t overdo it. The shoulders should be relaxed. Check your own posture several times a day, take note of your posture. Is your head centred over your torso? Is your chest slightly elevated? Are your shoulders down and relaxed? Is the curve in the lower back supported while you are sitting? Do this simple posture exercise several times a day! Release your shoulders away from your ears, lengthen your neck by feeling the crown of your head lift upwards, squeeze your shoulder blades together – hold for 10 seconds. This will strengthen the upper back muscles that keep your shoulder blades in a good position. Remember that good shoulder position does not mean rigid posture. Soften those shoulders! This entry was posted in Blog and tagged head, Pilates, Posture, shoulders on 22 April, 2013 by Eimear.